With Easter coming up, you might be looking for the perfect items to put together a special Easter basket. I always include at least one educational book or toy in my children's baskets. 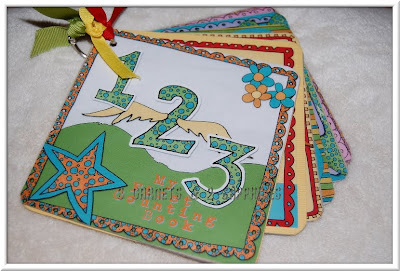 This 1 to 10 numbers board book titled My First Counting Book is a handmade creation by Tina O'Flynn, the mom behind the Etsy shop Soulful Creations. Since I've made it my mission to teach the our twins, who just turned 3, their alphabet, their numbers, and at least some counting by the end of the summer, I was thrilled to have been offered this chance to review this charming board book. Since the twins have been bored with the same old books we've had for years, I was hoping this unconventional looking book would peak their interest. 1) There is a charm about this book that you cannot find in a conventional book purchased from a bookstore. It is made well, but is clearly handmade with love rather than machine-made. 2) Both our twins could not wait to get their hands on this book as soon as they saw it. Every full-color page contained engaging images, many of which the twins recognized. 3) I like that the legibility of the numbers and the clarity of the quantity of objects to be counted were not compromised by the creative layouts. 4) The ring used to bind this book's pages together was decorated with gross grain ribbon. This is a very cute touch . . . one of the things that gives this book character. I would have preferred that there were two rings down the left side of the book instead of just one. At times, the twins had difficulty keeping the pages from slipping and sliding in their hands. This was a little distracting when I was trying to get them to pay attention to the numbers and the counting. 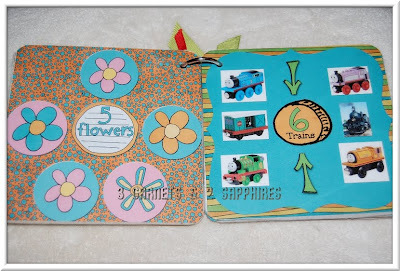 5) The page that received the most attention was the train-themed number 6 page. Both twins happened to recognize some of the train cars they own. Other pages that made them smile quite a bit were the ones containing Elmo, an 8-scoop ice cream cone, and the page featuring ten cakes. I think this book would make a great gift for any child age 2 and up who no longer puts objects in his or her mouth. Although the book's pages are smooth, they most likely would not hold up well if they became very wet. You can find My First Counting Book at Soulful Creations on Etsy. 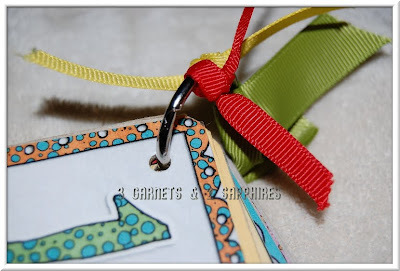 Check out this shop for handmade note cards and more items especially designed with children in mind. Thank you to Soulful Creations for sending us a sample book free of charge to base this review upon.